Complete Details of Jazz Weekly Mega Plus Offer…! Mobilink Jazz is the No. 1 Mobile Network in Pakistan. Jazz providing the best offers and services of SMS, Calls and Internet for its prepaid and postpaid customers. 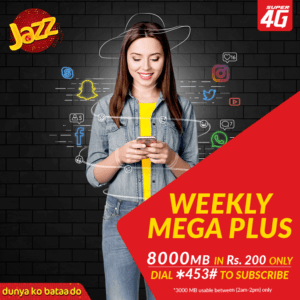 Now jazz offering Jazz Weekly Mega Plus Offer for its prepaid customers. This offer is for the prepaid mobile internet users. Now you can enjoy 4G Internet Non-Stop for full week. Jazz Weekly Mega Plus Offer is a low cost offer as you need to spend only Rs.200/- for this mega offer. If you really want to use high speed 4G Internet without any difficulty then must use Jazz Weekly Mega Plus Offer. The complete details of Jazz Weekly Mega Plus Offer with subscription are here that you should must check. Now jazz bring a weekly mega offer for the prepaid users at low cost. Now you can enjoy the super 4G Internet non-stop just in Rs.200/- for a whole week. You need to subscribe for this mega offer if you are a Jazz Prepaid Customers. By this offer you can use 5000 MBs for 7 days and also enjoy the 3000 MBs between 2AM-2PM throughout the week. The internet speed depends on other factors as device, SIM, accessed web pages, time, number of simultaneous users, distance from 2G, 3G, and 4G areas etc.